In a lot of ways, New Orleans was a city that didn’t really feel like a city. At least, not when you were staying in the French Quarter. Well… it didn’t feel like all other other American cities – and I say that now with reference to all the other cities I visited after New Orleans, given that at the time the only reference points I really had were New York, DC, and Baltimore. Yes, it was partly to do with the architecture and the fact that the city colonised by the French and so it had a very different aesthetic about it, but there were other little things. Vincenzo had mentioned the CBD of New Orleans a couple of times, pointing off in a vague direction towards the west whenever he did so. It struck me as a little bit odd that I hadn’t been over that way yet, given that in a lot of places – or in my hometown of Sydney, at least – the CBD was very much a happening place that was very close the life of the party, so to speak. Yet my time in New Orleans hadn’t taken me that way at all. I’d wandered around the French Quarter, discovering hole-in-the-wall bars, quirky shops, and even the Louis Armstrong Park just a few blocks away from Vincenzo’s home, but I found it interesting that what would probably be considered a focal point or highlight of many other cities was simply considered a business and financial district with not that much tourist appeal at all. 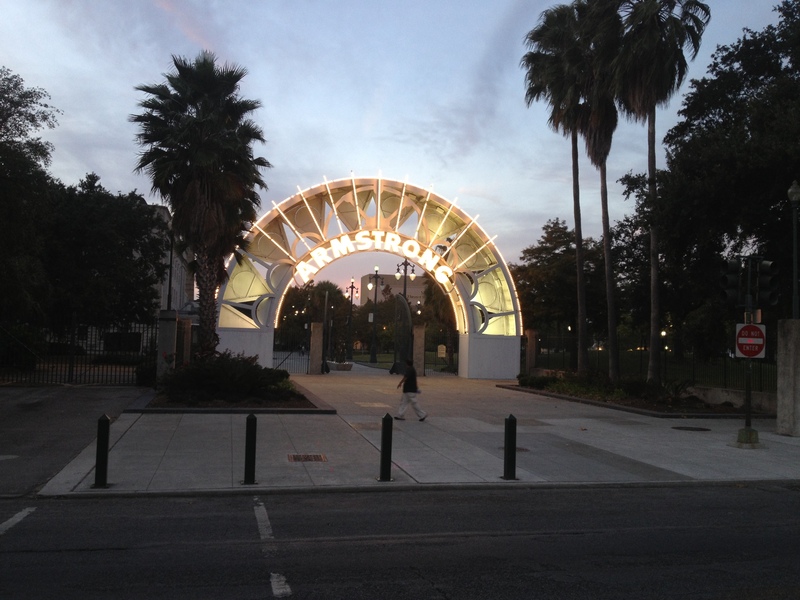 Entrance to Louis Armstrong Park. 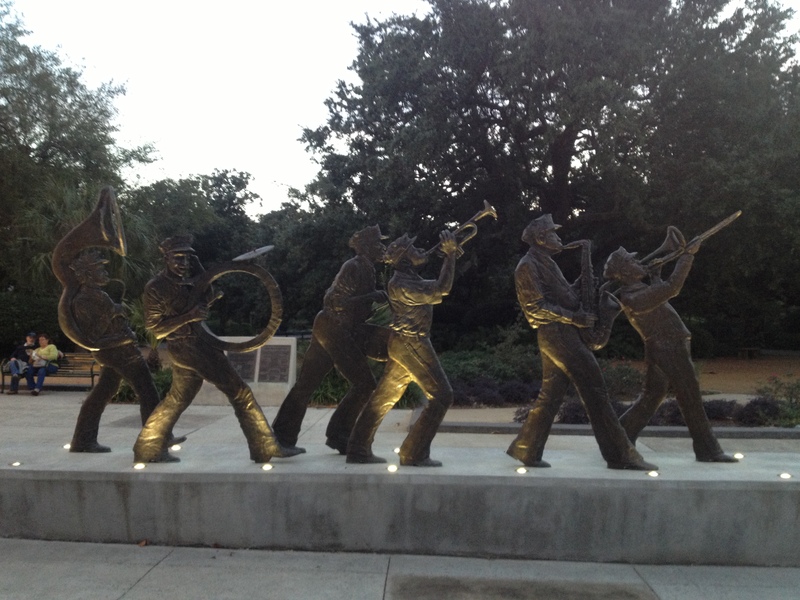 And his brass band – thought I don’t know that the statutes were made from. 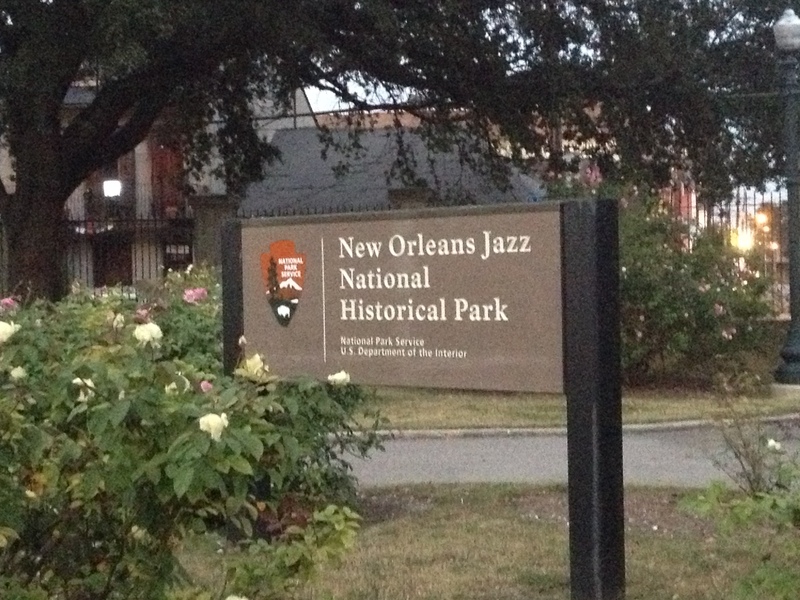 You know jazz is a part of the city’s culture when it starts sponsoring parks. However, I did end up going to the New Orleans CBD during my time in the city. When he wasn’t busy working, Vincenzo and I spent a lot of time together. Sometimes it would just be hanging around his house, and him surprising me by actually knowing the songs I was strumming on my ukulele simply from listening to the chords – I learnt he was a good singer when he burst into the room to join me for our own acoustic rendition of Radiohead’s Creep. Other times we would take short trips to some of his favourite cafés around the French Quarter or the Bywater and have a lazy brunch or a coffee, and afterwards we’d browse through second-hand stores and op-shops and marvel at some of their whackier wares and hidden treasures. And Vincenzo would pretend to not know me as I knew all the words and sang along to Whatever You Like by T.I. as it was playing over the store’s radio. Which only prompted me to sing louder. And add dance moves. He acted like he was embarrassed, but I was convinced he found it secretly endearing. At any rate, he didn’t kick me out of his house, so I can’t have been that bad. I just laughed and gave him a cheeky smile, though I had to admit it was kind of crazy, the bond the two of us had formed over such a short time together. If I’d had more weeks to spare, I definitely wouldn’t have minded spending them there with him. 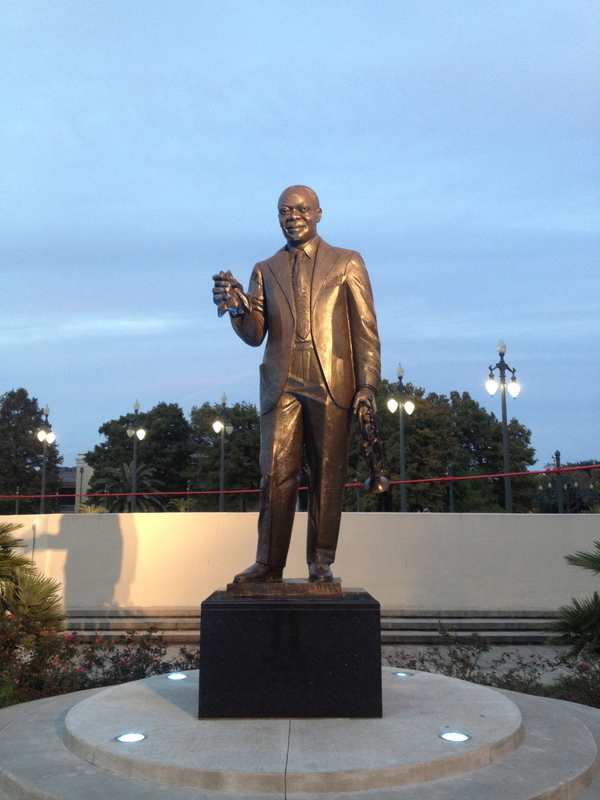 A lot of the time it felt as though Vincenzo felt he had a duty, not just as a temporary husband but as my host in New Orleans, to show me more parts of the city. When he had a full afternoon off he was adamant that he showed me some other areas so that when I left town, I could say that I’d seen more than such the French Quarter and Bourbon Street. In those kinds of situations I can actually be pretty indecisive, so I kind of loved that he could take charge and just tell me where we were going and what we were going to do. So on one sunny November afternoon we jumped on the scooter and he drove me right across the city, through the CBD and into Uptown New Orleans. The landscapes and scenery changed gradually from district to district, and as we rolled through the suburban streets and up St Charles Avenue, it was hard to believe we were actually in the same city. I might not have believed it myself if I hadn’t seen us ride there with my own two eyes. Most of the properties still had similar black wrought-iron fences like Vincenzo’s, but instead of smaller European style apartments they were big, beautiful houses with lush gardens and big trees. We went further Uptown and passed Tulane and Loyola universities, watching students moving to and from the campuses and sitting around in the sun. Eventually we turned and headed south-east – although since the geographic terminology is based on the bends of the Mississippi River, it was actually across Uptown – and drove along Magazine Street, where the sides of the road were lined with a variety of different shops and stores, all of which still maintained that authentic, slightly rustic New Orleanian vibe. We continued along Magazine Street all the way to the Garden District, a beautiful little area that is as lush and green as the name suggests, and after a few carefully chosen turns, Vincenzo eventually pulled up at a very specific house. 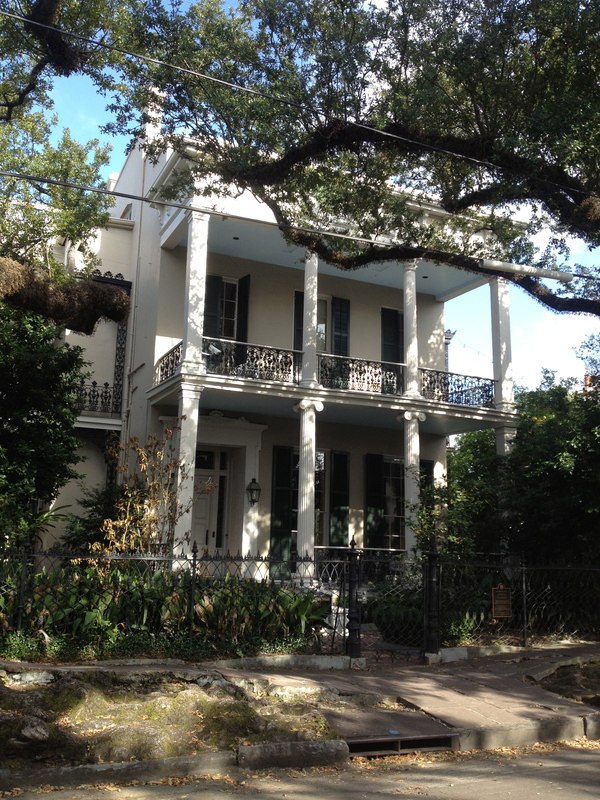 “This,” he announced, with something that almost sounded like a hint of pride (of which he had quite a lot for his city, so that was entirely possible), “is the house that used to belong to Anne Rice.” I’d learnt from Faith that her and Vincenzo had been, and presumably still were, huge fans of the Vampire Chronicles, and I myself had quite enjoyed reading a few of her novels in the past, so it was quite exciting to behold a building that held such a quirky and unique place in modern literature history. 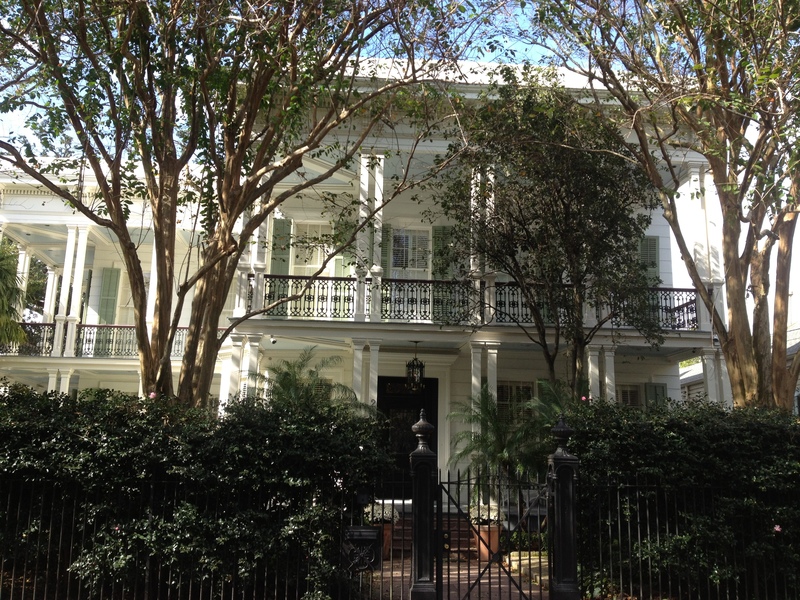 Anne Rice’s former New Orleans residence. 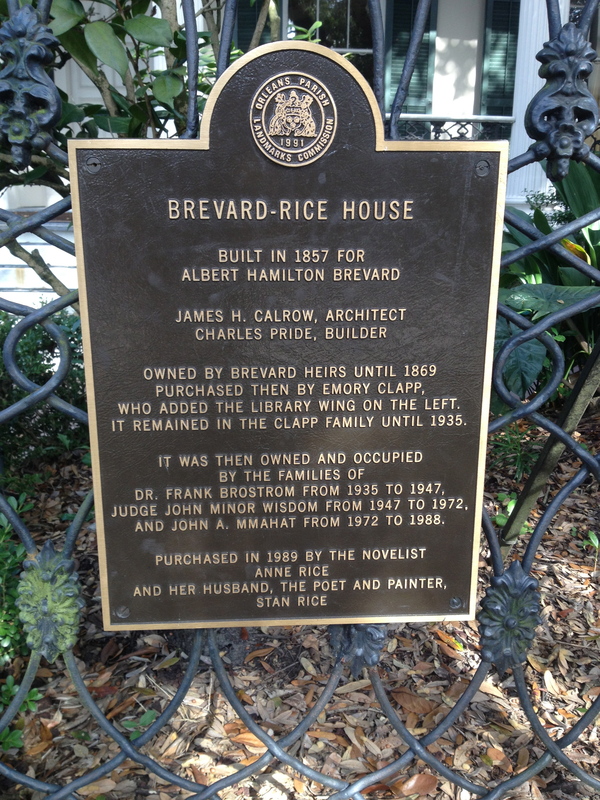 The sign out the front of the Anne Rice house. After we’d done the rounds on our Uptown excursion, Vincenzo turned the scooter in the direction of home… only to have it come puttering to a stop. “Ahh…” I don’t know the first thing about anything mechanical, but I was fairly confident that that wasn’t supposed to happen. “Hmm… that’s not good… I think we’re just out of gas,” Vincenzo said. He said there was gas station only a few blocks away, so we ended up just wheeling the bike through the streets together. It was a little different without the hum of the scooters engine as we walked along, and I think in that brief moment I truly experienced the suburban serenity that existed in this part of the city. Normally I’m not a fan of the suburbs, but in a place like this even the quiet streets and their big, haunted-looking houses had an strange kind of appeal about them. 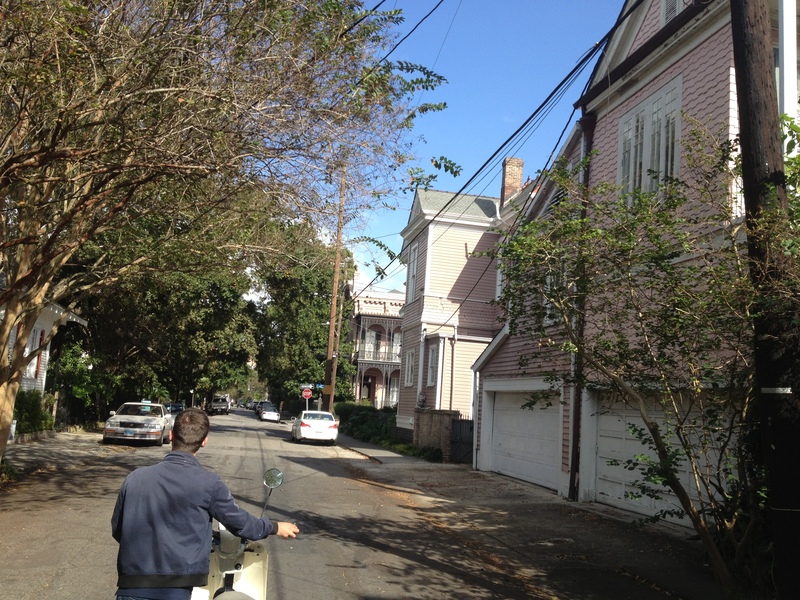 Vincenzo walking the broken down moped through the streets of the Garden District. After filling the scooter up with gas, we soon discovered that that hadn’t been the problem, because it still failed to start. As fate would have it, though, we were right near the place where Vincenzo said he takes the bike to get serviced. He managed to drop it off and we had lunch nearby while the problem was sorted out. As I said, I have zero clue about anything mechanical, so I don’t know what was wrong with it, but it was nothing major and it provided a little extra excitement on our Uptown tour. And it meant I got to sample some tasty tacos and a frozen margarita on Magazine Street while we waited. Which leads me to something about New Orleans that I was particularly impressed with: the food. Once again it was largely thanks to Vincenzo that I knew all the good spots to eat at, whether it was beignets at Cafe du Monde, the best Cajun jambalaya at Coop’s Place, burgers at Yo Mama’s Bar and Grill, or oysters and fried alligator at the Royal House Oyster Bar. Even getting a Po’boy sandwich on the local deli on the way home one day was an exciting experience for me. Although Louisiana falls towards the edge of what are typically referred to as The Southern States, it’s undeniable that it falls well within the branches of the ‘Southern hospitality’ state of mind, with cheerful and friendly service in every establishment and complete with its own unique cuisine of dishes and flavours, thanks for the Cajun and Creole influences that just aren’t present in the other surrounding states. 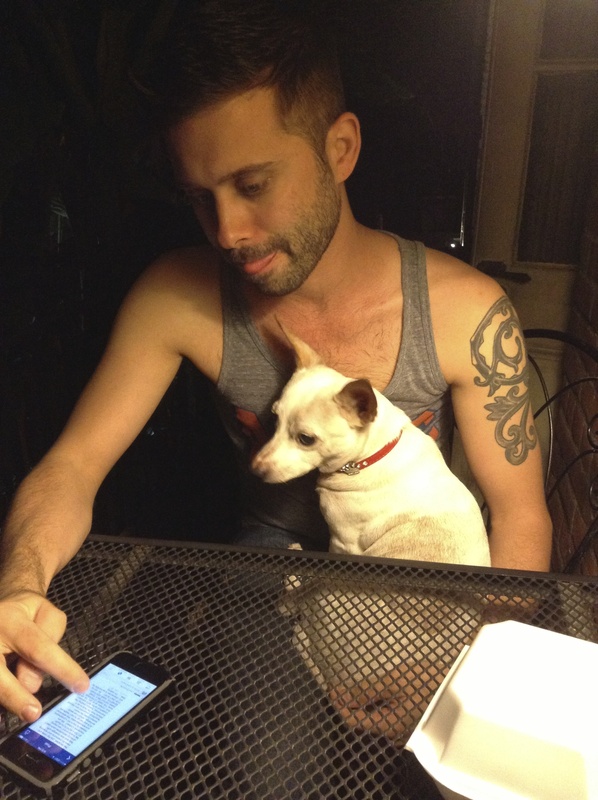 On my last evening in New Orleans, Vincenzo and I were set to have another house guest – another Couchsurfer whose request he had accepted a few weeks prior, before I’d even shown up in New Orleans. I’d been mindful of it when I was booking travel arrangements to Austin, which would be my next destination. “Well, she’s coming on Wednesday,” Vincenzo said to me. “But if your host in Austin can’t have you before Thursday, you can always stay too. There’s still plenty of room.” After all, it’s not like I was taking up the spare bed. “Well I mean, you can stay for longer, if you like. Stay forever, I don’t mind…” he said rather wistfully as he turned back to his own computer screen. He had a nonchalance in his voice, though I think he might have just been playing it cool, because I really believed that deep down he actually meant it, and would have loved it if I’d stayed. Which actually made it a little hard for me to book that bus ticket – I really had been having such a great time with him. I would have loved to stay longer too, but I did have a set date that I had to reach the west coast by, and there were still a lot of things I wanted to see between New Orleans and Los Angeles. So in the early evening on Wednesday, Johanna from Sweden arrived in New Orleans after a tour through Central America. Vincenzo was busy cooking in the kitchen, and I was coming back from taking Princess for a walk. We must have seemed like a pretty domestic pair, because after the introductions I had to establish that I was in fact a Couchsurfer too, and that we weren’t actually a couple living together. Although in the end I ended up playing host for Johanna that evening, since Vincenzo had some other business to which he had to attend. He was actually in the midst of recording some songs with another musician friend of his, and since his house was quite susceptible to extra sounds and noises, he’d asked if I might be able to take Johanna for a walk around the city while they were recording. So the two of us exchanged travellers tales and the obligatory US customs horror stories as I took Johanna through the streets of the French Quarter that I had called home for the last week. We did loops through the streets and down around Jackson Square, and I found myself regurgitating all the information that I had absorbed from Vincenzo and Faith about the history of the city, and the culture and the layout, and I surprised myself at how much I had actually learnt and taken in. “And how long have you been here?” Only a week?” Clearly Johanna was pretty impressed at how fast I had acquired the knowledge, too. “Yeah. Well… I had a good teacher,” I said with a smile, assuring her that she would be in good hands with Vincenzo as her guide to the city. We headed over to Coop’s Place for some traditional New Orleanian food for dinner before eventually heading back home. My last night in New Orleans was a little emotional. I was, as always, so very excited to continue on with my journey, but I hadn’t felt this sad about leaving a particular city since I’d left Berlin for the first time – leaving Dublin had been emotional too, but that was compounded by the stress of the US customs and regulations. In a similar way that I’d loved the weirdness and quirkiness of Berlin, New Orleans had captured a lot of my imagination, and a little piece of my heart. And then of course, there was Vincenzo. I felt positively blessed to have met him so early on in my stay. Not only was he gorgeous and had provided excellent companionship, he was so passionate about his city that his excitement and enthusiasm just proved to be infectious. 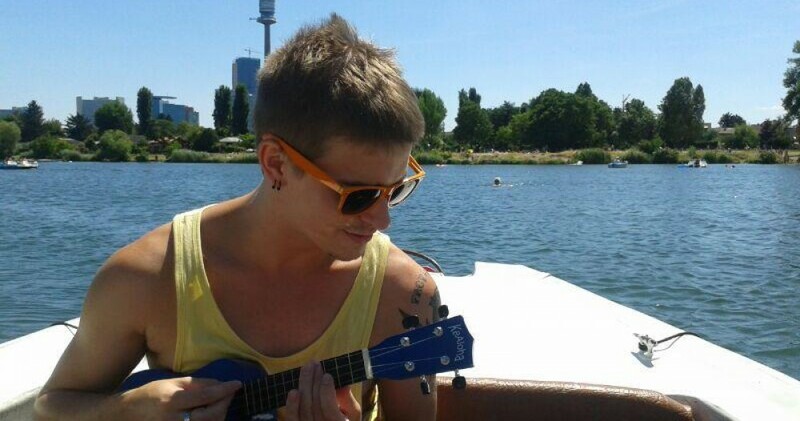 Similar to Joris and Thijs in Amsterdam, or Tomas and Matej in Prague, having a host and a guide who is so in love with the city they live in turns a typical touristic stay into quite a heart-warming and memorable experience. Vincenzo made me fall in love with New Orleans as much as he was in love with it, and for that I am extremely grateful. We’d grown quite fond of each other, Vincenzo and I, and had become remarkably close during the nine or so days I ended up staying in New Orleans. We made this bond, this connection – it’s hard to describe, but it was quite unlike anything I’d felt with anyone else, and to this day I still don’t think I’ve ever had such a connection with another person. I tried saying my goodbyes the night before – without getting to sad or emotional – in bed before we went to sleep: my bus was pretty early the following day, and I knew that Vincenzo wasn’t a morning person at all. But he still managed to rouse himself from his slumber as morning was finally breaking, and give me one last kiss goodbye before I loaded up with all my belonging and hit the road once again. I was excited about the rest of my journey, but my current mood and overload of feelings was going to make the two bus rides to Austin rather depressing, and there was no denying how much I was going to miss Vincenzo, little Princess, and the incomparable city of New Orleans. Candid camera shot of Vincenzo and Princess. He hates it, but it’s one of my favourites. So far most of my experiences in the US had been limited to either the glitz, glamour and bright lights of the big city, or the sightly more domestic lifestyle set against the backdrop of modest suburbia. 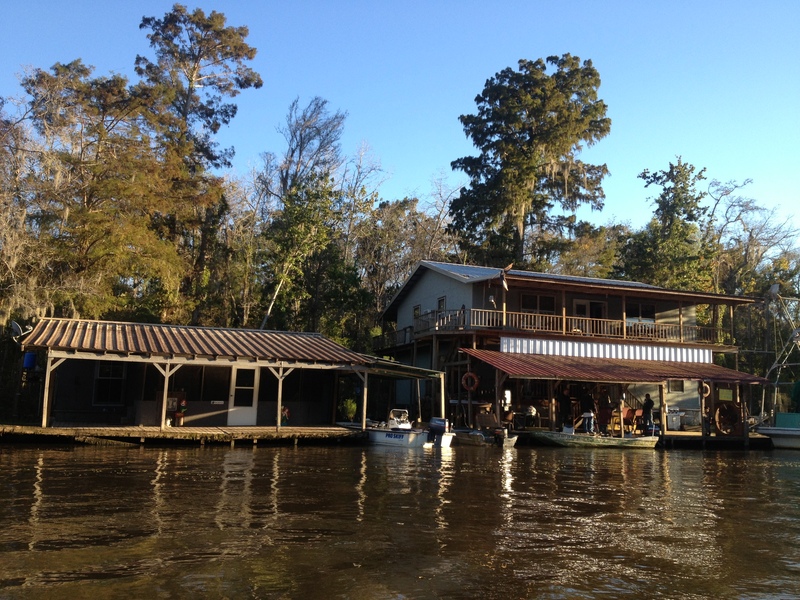 As my journey progressed, my stay in New Orleans afforded me with my first of several upcoming opportunities to explore some of the great outdoors that America had to offer. 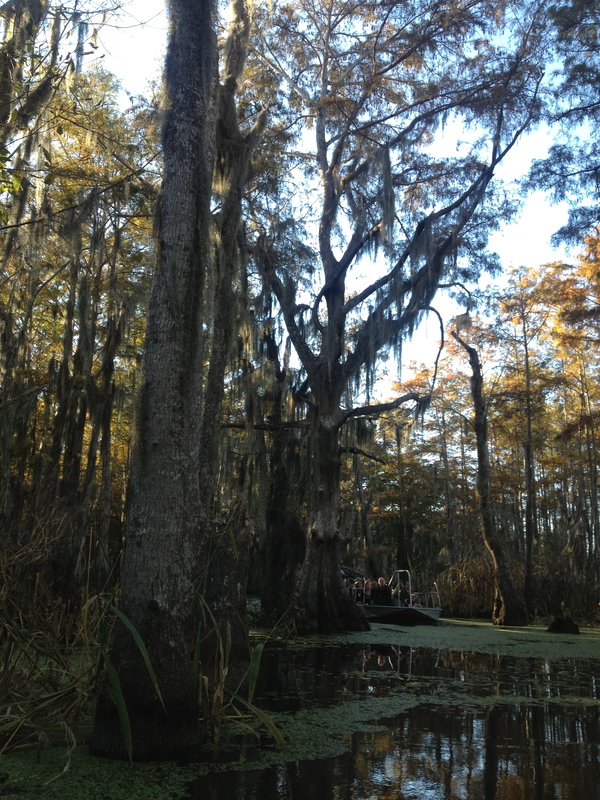 While it may have seemed like a very touristic activity, and I’ll admit was probably partially fuelled by an obsession over True Blood, part of me knew that I just had to take a day trip out of the city and visit the swamps of Louisiana. Even Vincenzo agreed that it would be something worth seeing. In fact, he was adamant that I got out there and saw more of the surrounding area, and didn’t get hungover and bogged down in the real tourist trap that was Bourbon Street. I shopped around some of the visitor centres that were scattered around certain corners of the French Quarter, and eventually chose to go along on one of the day trips – with the climate that it has, New Orleans was by no means cold, but it was getting slightly cooler, and the thought of a swamp tour at night perhaps played a little too well into the nightmare fantasies spawned by my television viewing. On the morning of my tour I rose relatively early, tiptoed my way around a still snoozing Vincenzo, and eventually set off to the tour pick up point. From the centre of the city, the swamplands were still a substantial drive out to the east, crossing the long bridge the stretched across Lake Pontchartrain, and eventually the urban sprawl faded out and gave way to the wetlands wilderness, a lot of which is located in protected national parks. The drive took the better part of an hour, and when we finally arrived at the tour company’s boat house, the bus full of people was divided into group and we were gathered up for our tours. 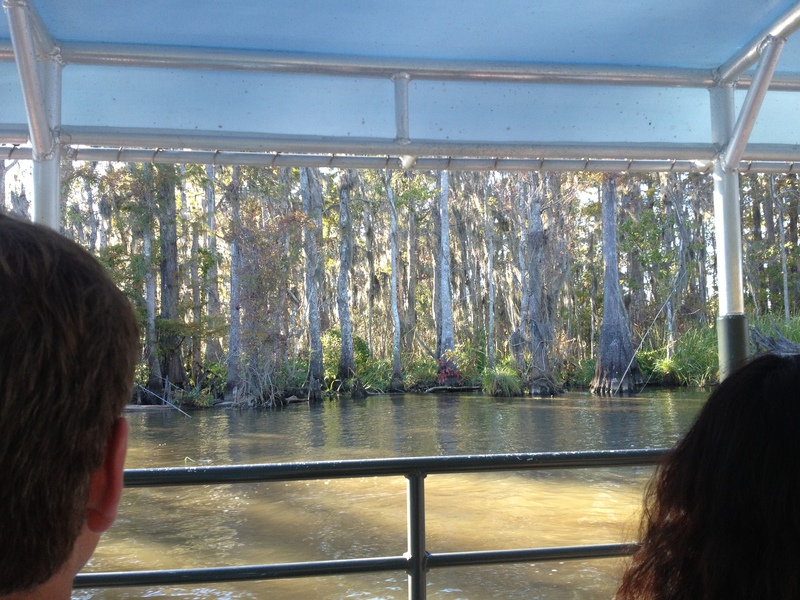 The boat ride itself almost reminded me of a similar tour I had done in the Daintree Rainforests in the northern reaches of Queensland back in Australia, but instead of the chance to spot freshwater crocodiles, the swamps of Louisiana were home to alligators. It was really a matter of luck as to whether we spotted any today, our boat driver/tour guide had told us – it wasn’t peak season but it wasn’t the worst time for spotting gators. 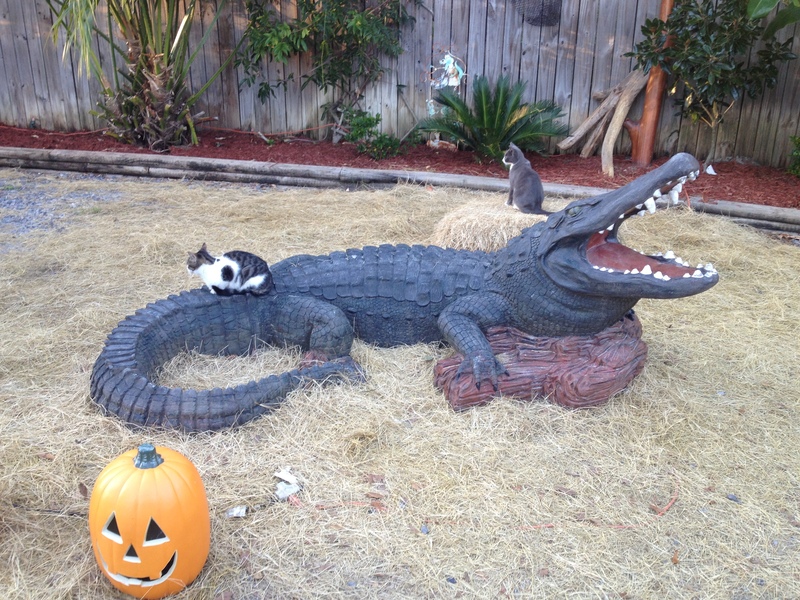 At least the cats aren’t afraid of the alligators. Trees along the waters edge. We did see quite a lot of wildlife in the tour. At one or two moments we caught the slightest glimpses of the elusive alligators, but there was nothing but eyes and snouts breaking the surface of the water. 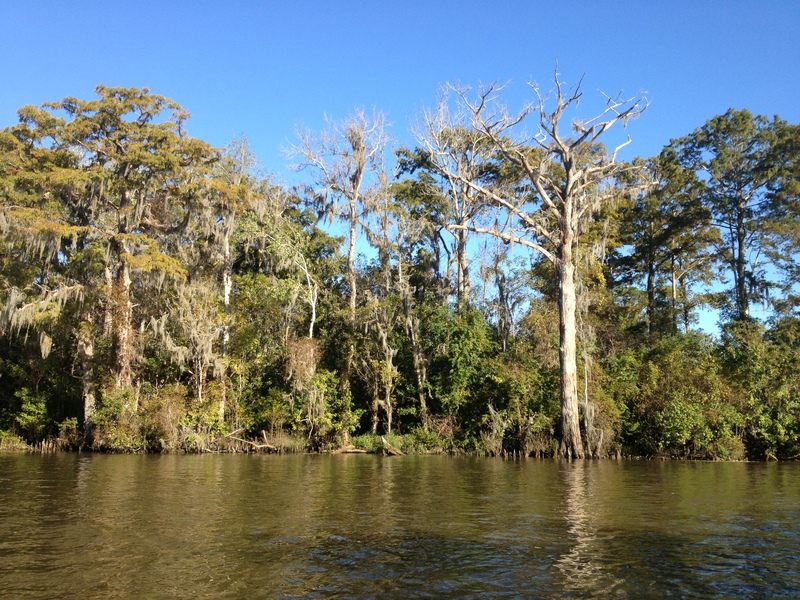 We also spotted a few species of birds, and even some of the trees and vegetation proved to be quite interesting as the boat turned off the main, wider bodies of water and into the winding paths through the marshes. 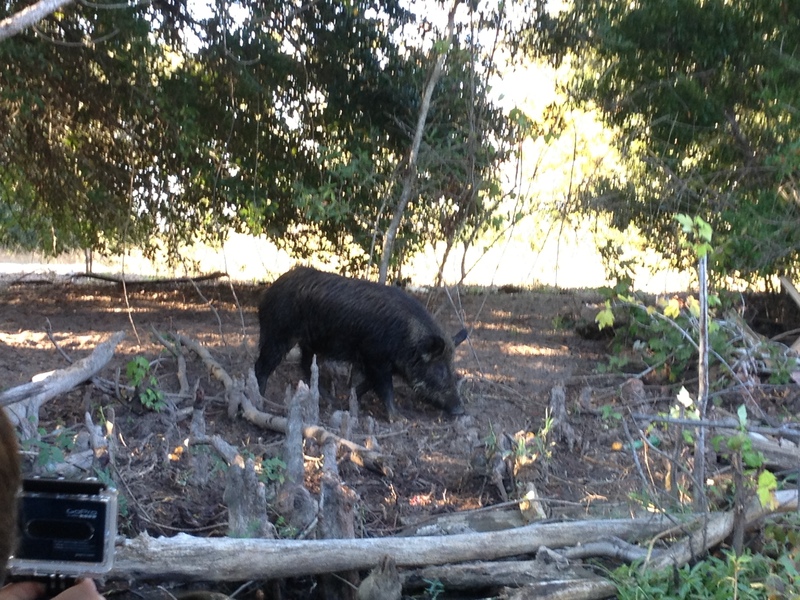 But when it came to the wildlife, the highlight was undoubtedly the wild pigs. 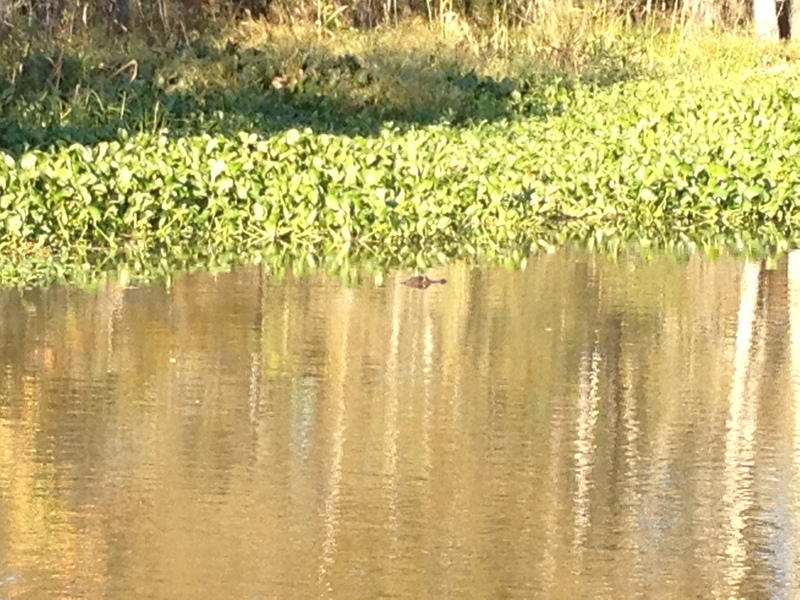 One of our few small glimpses of a gator. The winding waterway paths through the marshes. From the murky swamp water grows an abundance of lush greenery. The pigs must be quite accustomed to the tour groups coming up into their habitat, because they trotted over to the boat was an air of almost familiarity. Our guide seemed to greet them with a sense of affection too, though we were still warned to keep very clear from them and keep all limbs safely inside the boat. 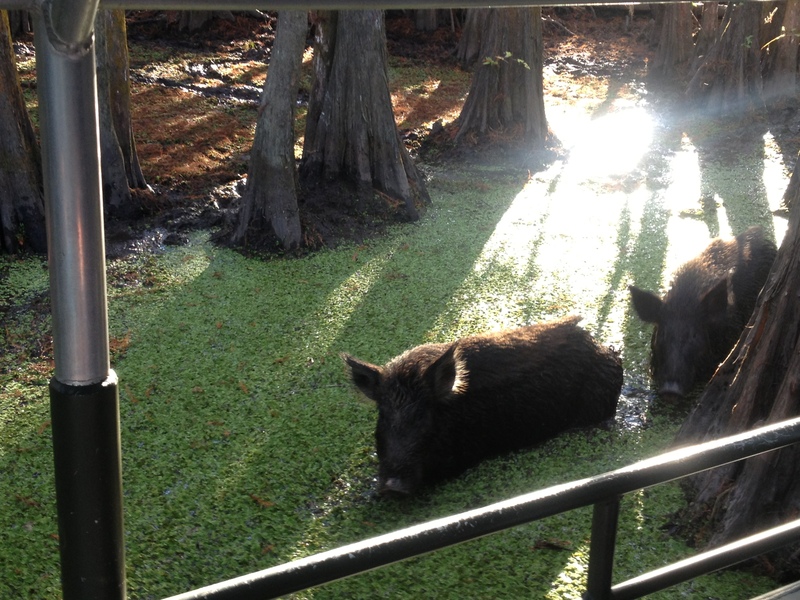 The guide had a couple of food scraps to give the wild pigs to encourage them to come a little closer, and they had no qualms about diving into the water and trudging through the marshes to get it, despite the stories we’d just been told about other tour groups who had witnessed one of the crowd favourites being ambushed and dragged off by an alligator. One of the bigger bull pigs. They waded through the shallow water and right up to the boat. 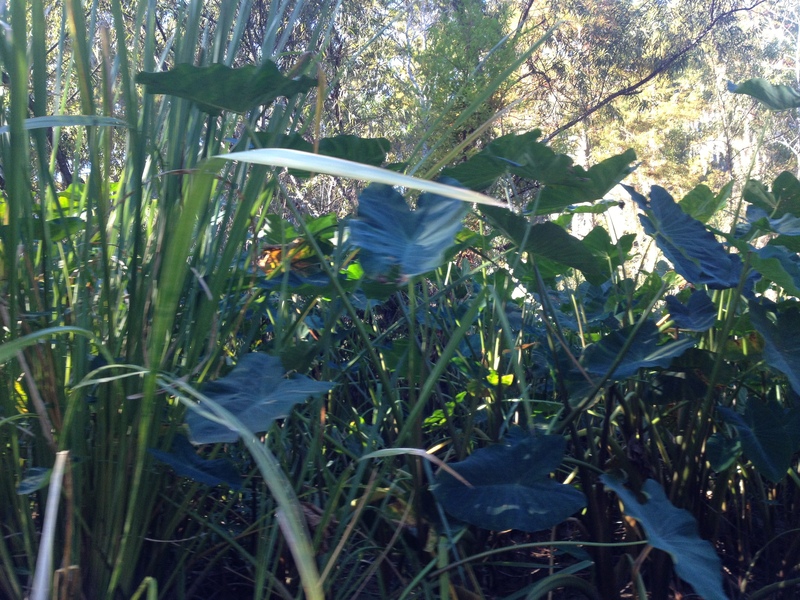 While the animals were entertaining, probably the most peculiar thing that we came across in the swamps that day – for me, at least – were the other people. Towards the end of the journey though the swamps, our boat went down one of the wider branches of the estuary to find a collection of water-front houses spaced out along the banks. But they weren’t the the fancy mansions that spring to mind when people first envision water-front real estate – most of them were simple homes that looked like any old cabin in the woods. 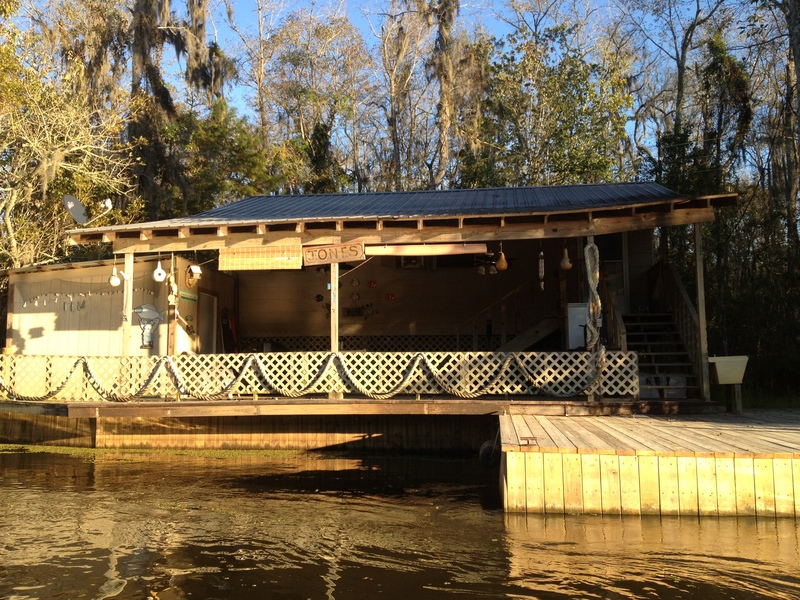 At some of the houses, there were men sitting on their porches overlooking the river, having a cigarette or a beer, or living up to the classic cliché and slowly rolling back and forth on a wooden rocking chair. Some of them did a polite wave or a salute. Some of them just stared us down as the boat went by. While I was all about surrounding yourself with nature, I struggled to accept the fact that people actually lived out here. Not only were they relatively isolated from civilisation by distance, but the only way to access their homes was by navigating a boat through the alligator riddled swamp lands. I couldn’t even fathom what like must have been like living in a place like that, and how radically different these people would be from someone like myself. Or would they? It was some tasty food for thought that I contemplated on the remainder of our boat journey home. 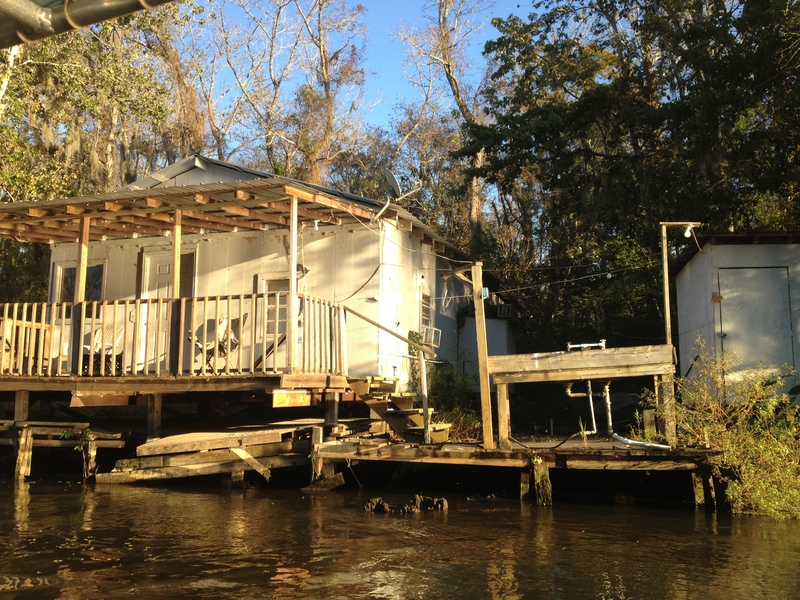 Swamp houses on the water, in the middle of nowhere. More houses along the marshes. They look like they would be a nice place to live if it weren’t for the isolation to people and the proximity to alligators. It was early evening when I finally made it back to the French Quarter. 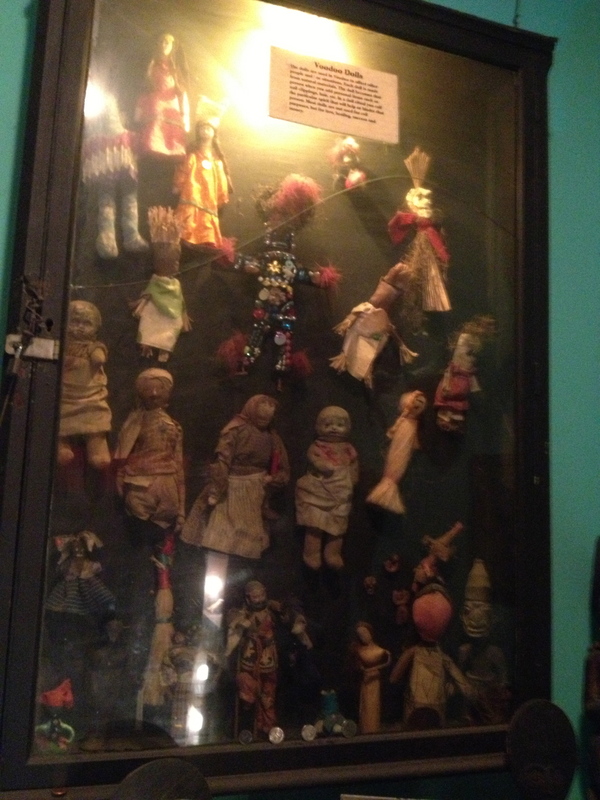 Vincenzo was still at work, so to kill a bit of time I went to visit the nearby voodoo museum. After my experiences over Halloween I wanted to check it out and see if there was anything more I could learn or understand about the crafts and practices. However, I have to admit that I would use the term ‘museum’ rather loosely when describing this place. It’s not a museum in the same way that the Museum of Natural History in London is – it’s small, specialised, and looks like it has been set up on the ground floor of someones house in the French Quarter rather than any actual official museum building. But then, given the content and subject matter within the museum, I think that kind of setting was actually a perfect fit. 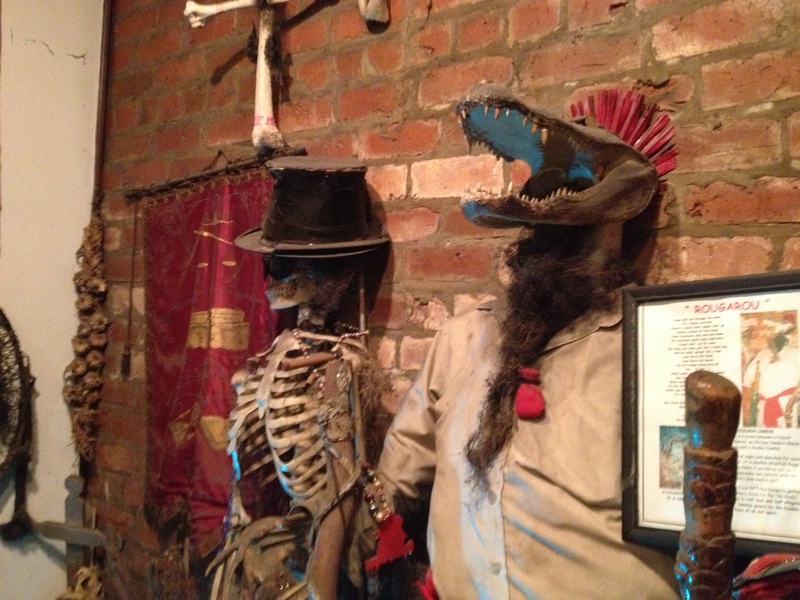 Model alters on display in the voodoo museum. 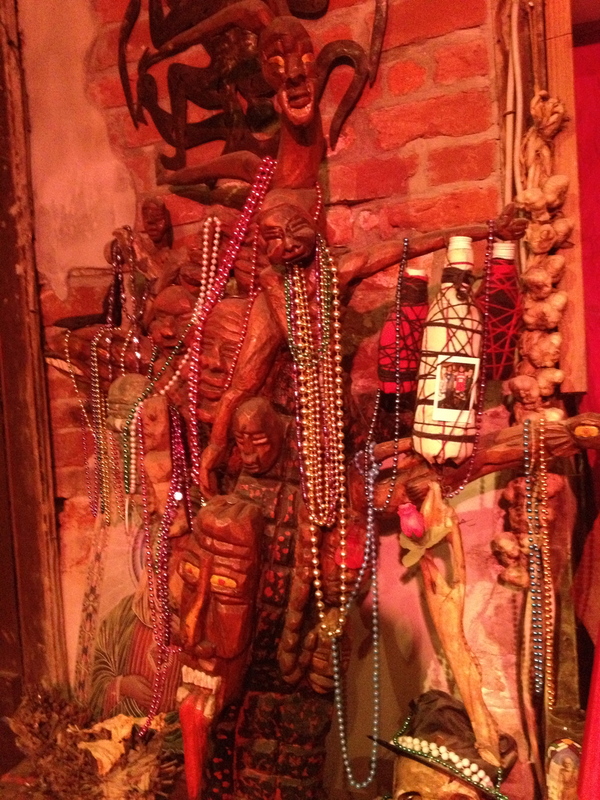 Sculptures and icons, draped the the iconic Mardi Gras beads. The museum itself had a shop out the front, selling a variety of mystic yet somehow also slightly commercial objects, and the exhibits themselves were limited to only a few rooms. Later, when I told Vincenzo about my visit to the museum, it almost seemed as though he was holding back a wince, or a pained expression. Perhaps he thought it was too stereotypical, or a simplistic introduction of voodoo, aimed at appealing to the curiosity of tourists rather than delivering any actual authenticity. But I managed to enjoy it as I took the exhibits with a grain of salt, and did see a few creepy yet fascinating things. 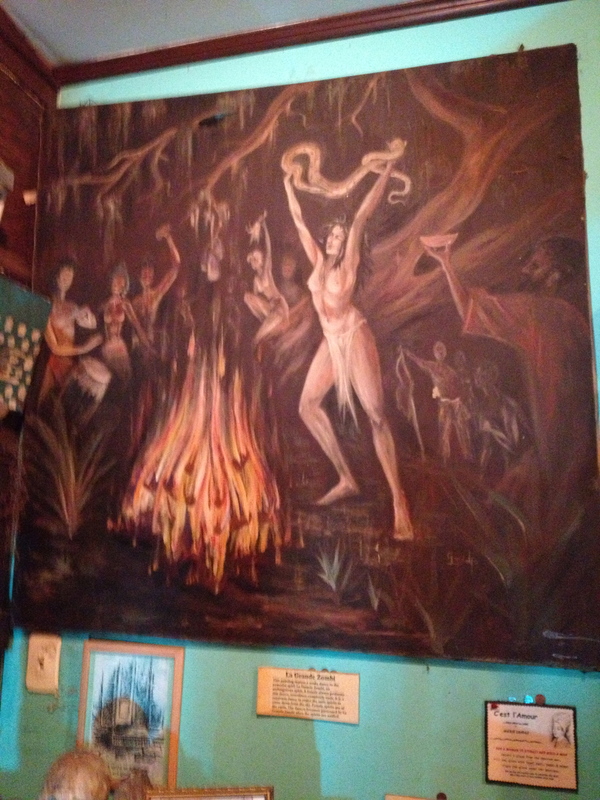 Artwork depicting tradition voodoo ceremonies. 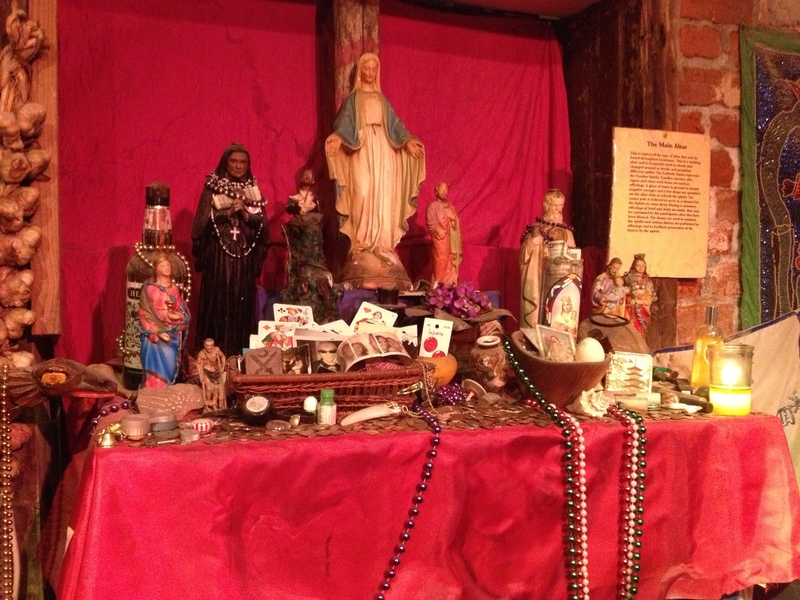 Physical depictions of some of the voodoo deities. 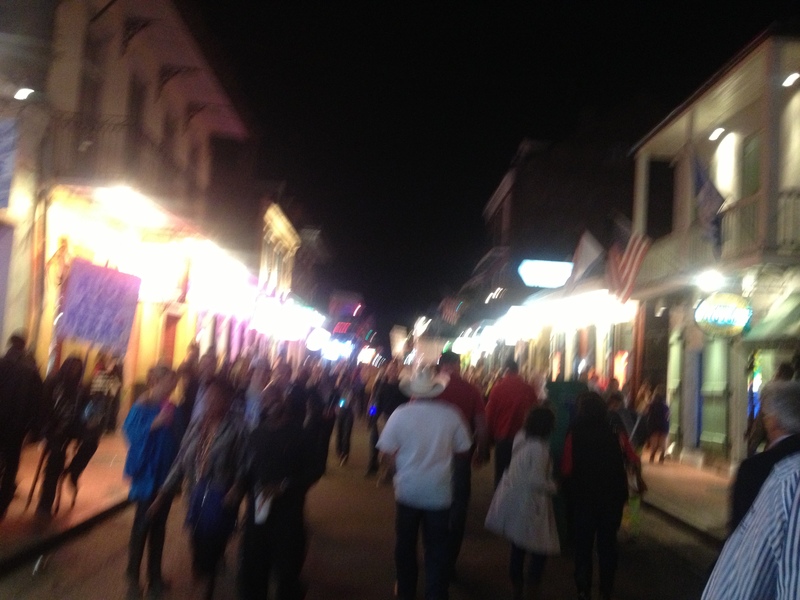 One other typically New Orleanian thing that I knew I had to experience in some capacity was the one thing every New Orleanian seemed to talk about with more just a hint of contempt, or at least with some undertones of remorse or regret: Bourbon Street. While all of my Halloween festivities with Vincenzo had taken place off the strip that is oh-so popular with tourists, the world explorer in me couldn’t simply be satisfied with the tales told by others when the real experience was waiting for me just around the corner. So after popping into the guest house to visit Vincenzo and tell him about my day, I went back out for a wander through the streets, with the intention of scoping out Bourbon Street and finally being able to form some opinions of my own. There’s no denying it – the street is crazy. Perhaps not crazy in the fundamentally kooky or weird way that some other aspects of New Orleans are, but Bourbon Street was definitely the setting for one hell of a raging party. Pedestrians wandered over the road, which had a total absence of cars – it was the weekend, so I can’t say for sure if that was a regular set-up – and from balconies of hotels, women danced with cocktails in their hands were bearing their breasts for the entire street below. Strip clubs with flashing neon lights beckoned passers-by, and karaoke bars with live bands spilled their music out the doors and onto the footpaths. The sidewalk itself was sprinkled here and there with food vendors, although most people seemed much more interested in their alcohol, which you could get in a take-away cup to go, if you so desired. Take-away alcohol was something I had noticed on Frenchman Street during my first nights in New Orleans, but it took on a whole new meaning here – as though it was a licence to get completely messed up and simply trash the joint. People were all over the place, as though the seventeen year old kids raiding their parents liquor cabinet for the first time had finally grown up, yet somehow never made it back to sobriety. The raucous crowds of Bourbon Street. Now, I’m not going to judge those people, because God knows I have been in similar, and undoubtedly much worse, states in my lifetime as a drinker and a partier. When people go on vacation, they want to party, have a good time, let their hair down, and get a little crazy. But I was stepping onto Bourbon Street for the first time having already heard the impressions of it from the New Orleanian locals, and that was something that I couldn’t just switch off. I like to party as much as the next young adult with limited to minimal responsibilities, but I’ve found that I’ve always taken a sense of pride in my beloved Oxford Street, the pink mile of Sydney where all my favourite gay bars are located. And from what I can tell, both the locals and the tourists take pride in it too, and we respect it. My impressions of Bourbon Street was that the party-goers not only had a lack of respect for themselves (excessive alcohol will do that to you), but also a severe lack of respect for the place they were in and the scene they were interacting with. I could potentially liken it to the spectacularly trashy scenes that I have witnessed in Kings Cross in Sydney, another nightlife district that for the most part is not respected by the partiers and revellers who travel far and wide across the city to get absolutely wasted and mess themselves up as well as the surrounding streets. I know local residents in Kings Cross who lament the state that the area so often finds itself in (although recent restriction laws have drastically changed that), and I can see a similar train of thought within Bourbon Street. But having said that, messy nightlife districts aren’t the worst that could happen to a city. It obviously attracts a lot of tourism, which I would hope at least does something for the city’s local economy, as New Orleans is still in a long process of recovery from Hurricane Katrina. Yet the French Quarter remained largely unaffected by the hurricane in the long-term, in comparison to some other parts of the city which were completely annihilated, and therein lies what I believe to be the thing that the locals take issue with about Bourbon Street the most – the rest of the city, which has so much more to offer than a trashy night out, is ignored. One filthy area is highlighted above all else, making the city a popular tourist destination, but for so many of the wrong reasons. And while Vincenzo was an amazing host for a variety of different reasons, I think I’ll always be the most thankful that he was able to steer me in a better direction, and show me how to get much more out of the city that I ever would have managed without his guidance. The juxtaposition of sin and depravity with apparent moral righteousness is actually kind of amusing. 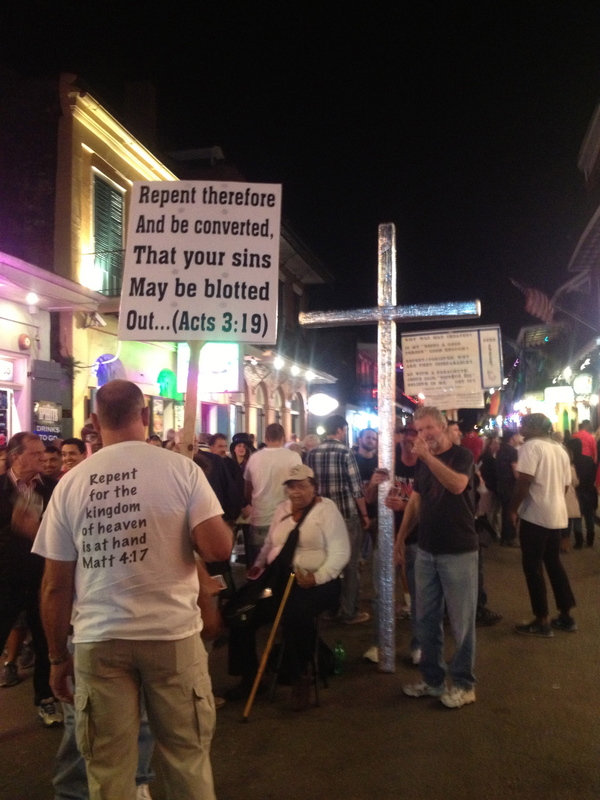 After all that, though, there were some entertaining aspects of Bourbon Street. In particular, the groups of religious people that camped out in the streets with their picketing signs and huge silver crosses, calling out Bible verses and cursing the party-goers for their sins. Talk about fighting a losing battle, right? There were a couple of hecklers who gave them grief, but for the most part people just laughed at them. They were impossible to take seriously when you saw them in an environment like that. I wanted to loathe the preachers, but I ended up feeling rather sorry for them – wasting their own time condemning people who were simply having fun. That’s no way to live, in my opinion. So despite everything, I marched down Bourbon Street with my head held high, a proud sinner, taking in all the lights and the laughter in the rambunctious scene around me. I had finally checked the “visiting Bourbon Street” box on the to-do list, and while my stroll down the street was probably atypical, my sobriety at the time allowed to me to come out of it with a somewhat fresh perspective that I must assume very few tourists would ever walk away with.